Children and lice. With the school year just around the corner, it seems to be a fitting time to bring up the subject. Guaranteed, if you have children and they are in a public school or day care of some sort, you will probably get a letter that states that so and so has lice and you should take precautions with your children. It's nasty, I know...but it is bound to happen. I remember when I was taking swimming lessons at a school pool while I was a child. My mom received word that there was lice found in the pool and all my siblings and I had to be treated. At the time, all that was available on the store shelves was a nasty brown shampoo that smelled icky and that we HAD to use. It was disgusting...and from that time I have vowed to try to prevent lice in my family. Hair care has come a long way since that time and now there are some fantastic products on the market to aid parents in repelling, preventing and treating lice infestations. I am going to introduce you to a fabulous company today that does just that! Zippity Doo's provides families with all year round, affordable, daily use lice prevention, eliminating harsh and costly treatments as well as the hassle, expense and stigma associated with head lice infestation. The popularity of Zippity Doo's has grown rapidly with parents who are concerned about lice prevention for their children at school or camp. Featuring natural ingredients, the line is pediatrician approved, laboratory tested, paraben free, and sodium laureth sulfate-free. Hair care products from Zippity Doo's are made with a special combination of natural ingredients designed to promote healthy hair and scalp while supplying maximum protection against head lice and other insects. 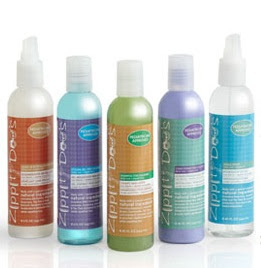 Zippity Doo's was created for children and is mild enough for daily use by children and adults, too. For me, having a product like this on hand is priceless. Especially given the fact that mommy and daddy can use it too! My hubby works at a college and you know, lice are NOT picky about what kind of school they infest! So, it is nice to have these products. So, for this review I was sent one of each of Zippity Doo's products. I was sent the Shampoo, Conditioner, Leave-in Detangler, Styling Gel and the Shield Spray. I will say here that I love the colorful bottles and labels! Very nice for a children's product...and classy enough to give as a gift too! I also love the ingredient list of these products...Wild Cherry Bark, Rosemary, Lavender, Lemongrass, Avacado Oil and Geranium Extracts to name a few. Lovely!! The first product I tried was the Styling Gel and I tried this out on my son. Now, he is one and does not have a full head of hair yet. But, he has the cutest little natural mohawk on the top of his head. (You can barely see it though). So, I put some of this gel in his hair and tried to get his little "do" to stand up. It was really cute...small, but cute! I love the smell of this product too...it smells so clean and fresh! The other thing that I loved was the fact that it didn't stay sticky on my hands...it dried right up and was gone within minutes. Tonight was bath night so we tried the rest of the products on Hannah while she was bathing. The Shampoo is a pearly green color and doesn't create a thick lather. It too smells really nice and does have a stronger scent. But it is NOT a nasty scent at all...I loved it! I also didn't have to do a lot of rinsing of her hair as the Shampoo came right out. Then, I applied some of the conditioner and this really smoothed and conditioned her hair nicely. The Shield Spray is meant to be used on bedding, clothing, toys, combs, hair accessories and even hair itself. It protects and creates barriers from lice...which is really neat. I can really see myself sticking this spray into my child's suitcase before he/she heads off to camp. When you think about just what is really in those cabins, you can be totally grossed out in a hurry. EEEW! Zippity Doo's products can be purchased at mass retailers, drug and grocery stores. You can also look on their website for a complete locations listing. Each of these products retails at $9.99 and I think that is a very reasonable price to pay for the prevention of lice!!! So, in my opinion...Zippity Doo's has some really great products! I love all of the scents and results of the hair care items I received. My daughter's hair looked and smelled so clean after using Zippity Doo's and I am really confident that if lice ever rears it's ugly head around here, it will be quickly wiped out...hopefully LONG before it has a chance to settle in!! Visit Zippity Doo's and then come back here and leave me a comment telling me what you which of their products you would most love to win. :) You do not have to be a blogger to enter, but you must have a valid email where you can be reached should you win. If you do not leave an email address, it must be where I can easily find it. This giveaway is open to US residents and will end 8/22 at 11:59 pm EST. The winner will be chosen using random.org and will be notified by email. The winner will have 48 hours to respond, or another winner will be selected. 1. "Like" Zippity Doo's on Facebook (you can tell them that In My Opinion sent you). 2 entries, so 2 comments. 5. Tweet about this giveaway. Leave a comment with the link. 3 tweets per day (at least 1 hour apart). 3 comments per day. Disclaimer: I received no monetary compensation for this post. I did receive Zippity Doo's products for review purposes. All quotes and stock photos are from the Zippity Doo's website and email. All thoughts and opinions are 100% mine. I would love to win the detangler! My daughter gets the worst tangles! I would most like to win the Leave-In Detangler. I would most like to try the shampoo. My 5 year old granddaughter just went through a miserable bout that she picked up from daycare. It would have been wonderful to prevent it or lessen it. Every year our school gets a nasty lice outbreak, so the shield spray would be great to have on hand. I would most like to try the shield spray. So many possibilities for use such as spraying my neck and hair when I go to a movie and lean on the back of the seat. I always worry about bringing home nasty critters. I would like to try Zippity Doo’s™ Conditioner for Children. posted on Zippity Doo's on Facebook that you sent me. i definitely need the leave in detangler for my daughter! I would love to try their Leave In Detangler. Would love to try them all of course...but if I could only pick one, I think the shield spray would be really useful. Thanks for the opportunity! I would LOVE the detangler for my daughter !! I would like the leave in detangler! I'd love to win their shampoo! I would love to try it all. I would love the styling gel for my son's hair and the detangler for my daughter!